Added "The Price of Victory" under the 5th Division History tab. Added Private Alfred L. Martin to the Tributes page. Added Corporal Robert H. Johnson to the Tributes page. Added Captain Aaron Gove Wilkins to the Tributes page. Added Platoon Sergeant James W. J. B. Kitchen and Private First Class Clinton A. Palumbo to the Tributes page. Added a photo of the 1117th Platoon to the Unit Photos page. I completed the website transition so everything should be in it's place. I like the new look. I reorganized the Tributes section into three alphabetical groupings which should be better going forward. Added Corporal Harold E. Reynolds and Victor P. Greggi to the Tributes page. Happy 73rd Iwo Jima Flag Raising Day! To celebrate I'm reformatting the entire website to a new look. Everything might look a little weird for a few days. Added an Iwo Jima Anniversary logo to the Home page. Added a news alert of the passing of Senator Gilbert Kahele to the Home page. Added Private First Class Samuel Bernstein to the Memories page. Added 2nd Lieutenant Thomas Drew Brindley to the Vietnam Legends page. Added Sergeant David Harold Brown to the Vietnam Legends page. Added a 1943 Parris Island photo of Platoon 663 on the WWII Unit Photos page. Added a page for Con Thien under the Vietnam History tab. Added Private First Class James Michael Aston to the Vietnam Legends page. Added Corporal Thomas Lee Blevins, Jr. to the Vietnam Legends page. Added a page for Operation Allen Brook under the Vietnam History tab. Added two more photos of Corporal Charles E. Moon to the Memories page. Added a page for LZ Margo under the Vietnam History tab. to the Awards & Decorations page. Awards & Decorations should now be complete. Added two great reunion photos, one on the Home page and one under Reunions. Added Corporal John C. McWilliams to the Memories page. Added a Company A, 28th Marines photo to the WWII Unit Photos page. Added Corporal Charles E. Moon to the Memories page. Added the 2016 Officers and some general information for the FMDA. Added a list of the Past Reunions of the FMDA. Added photos for Joseph Tenyer, Jr. on the Memories page. Added Private First Class Russell E. Farmer to the Memories page. Added a new website Chutes & Skulls to the Links page. Added Harry Liversedge and Fred Haynes to the Legends page. will serve the veterans of ​the 5th Marine Division and their families for a long time to come. Reworked the Home page and moved some things around. Added Hospital Apprentice First Class Joseph Tenyer, Jr. to the Memories page. Added the Ernest "Boots" Thomas Gravesite and Memorial Plaque to the Monuments & Memorials page. Added Private First Class Kenneth J. Grimm to the Memories page. Added a recent event I took part in to the Events & Exhibits page. Added a Thanksgiving message to the Home page. ​Added Private First Class Doyle W. Wood to the Memories page. Added Pharmacist's Mate Third Class Albert Vaini to the Tributes page. ​Added Corporal John H. Velez to the Memories page. Added Private Henry E. Grant to the Tributes page. Added 1st Lieutenant John Keith Wells to the Legends page. Added Gunnery Sergeant Vernon Lee Seaman to the Memories page. Added the Distinguished Flying Cross recipients on the Awards & Decorations page. Added the Navy and Marine Corps Medal recipients on the Awards & Decorations page. Finished the Navy Cross section on the Awards & Decorations page. Adding more content to the Awards & Decorations page. The Awards & Decorations page is under construction. I'm making some formatting changes and will be listing all Navy Cross recipient's names. Added Pvt. George Truitt Grant, Jr. to the Tributes page. Made some subtle visual improvements to the Legends page. Added the 66th Annual 5th Marine Division Association Reunion in Virginia Beach to the Reunions page. and will do my best to keep the Home page updated with the day-to-day history of the Iwo Jima campaign. I messed around with a few more design elements on the website. I like the new look. It's a little cleaner, not as dark. have wanted to give them a special place on the website for quite a while now. or reenactments that relate the the 5th Marine Division. Added an Iwo Jima Reunion which takes place March 4-8, 2015 in Oceanside, California. Added the Iwo Jima Association of America Reunion which takes place February 18-22, 2015 in Quantico, Virginia. Added Cpl. Patrick C. Foyle to the Veterans' Stories page. Oh yeah, and I'm trying a new design format for the website! Added Private First Class Harold Henry Schultz to the Legends of the 5th page. Added The Marine Corps Times to the Links page. I was interviews by them today for an upcoming story. Added an excellent blog called Marines in Forest Green to the Link pages. Added the World War 2 Guys, my reenactment group here in Omaha, to the Link page. A huge thank you to everyone who has supported me and our article in the Omaha World Herald. I'm overwhelmed that I've had over 2,000 hits on this website in the past two days! If you do email me it may take me a few days to get back to you. Added Cpl. George D. Gibson and Sgt. James M. Kirkland, Jr. to the Veterans' Stories page. Made a little John Basilone tribute on the Home page. Added Pfc. Angelo Ciotta to the Veterans' Stories page. Finished the Camp Tarawa history page. I'll be adding photos on all of the history pages soon. Started adding content to the Off To War page. My plan for this week is to fill in my history page timeline gap between training and Iwo Jima. Tonight I added some new material to the Camp Tarawa history page. Added a new page under Media called 5th Division Unit Photos. On this new page I then added a Company E, 28th Marines unit photo from 1944. Added two souvenir flags from the 27th Marines to the Memorabilia page. Well folks, it's over. This project was a major undertaking of time and energy, but in the end it was all worth it. My sincere thanks goes out to everyone who read the daily updates. And to the Marines of the 5th Division, my deepest gratitude. I added two more Harold H. Schultz photos to the "Flag Raiser Mystery" on the Men page. Are you still reading? It's been a long campaign updating the site every day. It's been so fascinating walking through a battle one day at a time. I have a lot of emails to answer, but I might not get to them until after March 26. The mystery flag raiser has been identified. Check out the Flag Raiser Mystery on the Men page. I posted new material on the website for 18 days in February - a new record for me. And here comes March, in like a "Lion of Iwo Jima"! The daily Iwo Jima updates keep chugging along. I'm pretty much thinking about Iwo Jima 24/7 now. Posted D+5 and D+6 tonight. I was getting a little behind. Changed the photo on the About page. on the Men page involving some questions on who really raised the second flag. It has been very insightful to reflect upon the actions of each day of the battle, one day at a time. its permanent new home under 5th Division History > Iwo Jima > The Battle of Iwo Jima. Remembering the brave men of the 5th Division on this eve of their D-Day. The ball is really rolling now on the day-to-day coverage of the Iwo Jima campaign. I've had over 430 hits on the website today already!!! Added D. A. Carson to the Legends of the 5th page. The day-by-day campaign updates on the Home page are starting early with D minus 3! Added a new page under Media called 5th Division Finds with a cool Marine Corps billboard. Added an anniversary logo to the Home page in preparation for next week. I wrote a blog post about the process on the Thoughts page. feature daily battle reports from the 5th Marine Division's campaign as well as a daily photo. Added Iwo: Assault on Hell by James F. Christ and Iwo Jima by Richard F. Newcomb to the Books & Film page. Added Angelo "Charlie" Cona and Walter "Pappy" Allen to the Legends of the 5th page. Added a Navy Corpsmen photo to the Home page. Added Cpl. Nicolas Hernandez to the Veterans' Stories page. American Hero to the Books & Film page. Wishing everyone a very Merry Christmas from 5th Marine Division.com. Added Henry A. Ford to the Veterans' Stories page. Added From the Volcano to the Gorge and God Isn't Here to the Books & Film page. and Give Me Fifty Marines Not Afraid To Die to the Books & Film page. Added the United States Marine Corps History Division to the Links page. Added Daniel E. McLeod to the Veterans' Stories page. Added George Wahlen, Jack Williams and John Harlan Willis to the Legends of the 5th page. Added The Quiet Hero by Gary W. Toyn to the Books & Film page. Added a new section called Vietnam Legends to the Vietnam tab. Added Robert C. Burke and Karl G. Taylor, Sr. to the Vietnam Legends page. Added a 5th Marine Division matchbook and two Welcome Home buttons to the Memorabilia page. Added the map from the inside cover of The Spearhead to the Maps page. Added Pvt. Charles B. Ranger to the Veterans' Stories page. Added Golden Arrow Military Research to the Links page. Updated Pvt. Eritt Wood, Jr.'s profile on the Tributes page with a wartime photo of him. Added the Khe Sanh Veterans Memorial to the Monuments & Memorials page. Added a Khe Sanh Veterans site on the Vietnam Links page. Added a Holiday greeting to the home page. Added Tony Stein and William Walsh to the Legends of the 5th page. Added Pfc. Richard C. Palmer to the Veterans' Stories page. Posted a Thanksgiving Greeting on the Home Page. I'm so thankful for everyone who I've been in contact with this past year on the website. It has been a privilege and an honor to share in your family's stories. Posted the two American flags raised over Mt. Suribachi on the Memorabilia page. Added some new photos to the Photo Gallery page. Added an Articles page under Media. I want to thank Ken Harper for providing me with a lot of new material. Added Pvt. Eritt Wood, Jr. to the Tributes page. I will be visiting Hong Kong and China from Oct. 14 to Oct. 25. I will respond to any e-mails when I return. Added a new video interview featuring me and some of my Great Uncle Bob's story on the Home page. Added the 5th Division Monument in East Meadow, NY to the Monuments & Memorials page. Added the Camp Tarawa Detachment to the Links page. Thanks Kathy Painton!!! Added Pfc. James Earl Weaver and Pfc. Don Sams to the Tributes page. Thanks for all of your emails and inquiries. I'll be adding lots of new material to the website in the weeks to come. Added some new photos on the About page and Home page. Worked on Corporal Charles Beidleman's Legends of the 5th profile. Added Corporal Charles Beidleman to the Veterans' Stories page. I am working on adding him to the Legends of the 5th Page as well as he was with the group that secured the top of Mt. Suribachi. A big thank you goes out to Claudia LaChance for providing all of the photos and materials for Mr. Beidleman. Added more Vietnam links and moved it under the Vietnam header. Added Franklin Sigler to the Legends of the 5th page. Started adding Vietnam related sites to the Links page. Added Hubert Eino Harju to the Tributes page. Added "CAL" Stegen to the Veterans' Stories page. Added The Bloody Battle for Suribachi to the Books & Film page. Updated the 5th in Vietnam page with new information provided by Ron Hoffman of Charlie Battery 1/13. I had some operational dates and enemy kill numbers wrong for Operations Chinook and Chinook II. Thanks Ron! Added Donald J. Ruhl to the Legends of the 5th page. Added George Phillips to the Legends of the 5th page. Updated John Basilone's profile to include a more detailed account of his actions on Guadalcanal. Updated the Medal of Honor markers so they tie in better with the new website design - no more black boxes. 5th Marine Division.com got a makeover today. Let me know if you like the new look or preferred the old design. Thanks! Added some Marine Corps films to the Vietnam Books & Film page. I was surprised at how few Marine Corps movies there are for Vietnam. Added a link to a 31st Seabees site on the Links page. I'm finally back!!! April was a busy month at work. Added Joseph Julian, James La Belle and Harry Martin to the Legends of the 5th page. Added Glen W. Binegar and Carroll L. Caples to both the Veterans' Stories page and the Tributes page. the 5th Division Memorabilia page. Added D+21 through D+35 for Iwo Jima history. Added D+11 through D+20 for Iwo Jima history. Created some sub-headers for the daily reports on the Iwo Jima history page. Added D+4 through D+10 for Iwo Jima. I've been hot on Vietnam lately... Added 1969 to the 5th in Vietnam page. Added a new page called Vietnam Tributes under the Vietnam menu. I added Larry Eugene Adolf and Philip Gregory Wigton both of Omaha. Added a new page called Vietnam Books and Film under the Vietnam menu. I will continue to add to it as I find new material related to the 26th, 27th and 13th Marines. Added 1968 to the 5th in Vietnam page. Added a really cool photo to Bernard A. Plotkin's story on the Veterans' Stories page. It shows five Omaha, Nebraska men on a transport together on the way to Iwo Jima. My thanks goes out to Justin Plotkin for sending it to me. Added more items to the 5th Division Memorabilia page. Added a number of Marines to both the Veterans' Stories page and the 5th Division Tributes page... Bernard A. Plotkin, William E. Potts, Harold George Schrier, Walter E. Hudson. 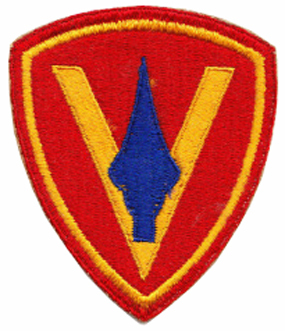 Added 7th Fighter Command and Iwo Jima History to the Links page. Started adding daily reports for the Iwo Jima campaign on the 5th Division History page. Added a few new maps under Media. Reorganized the menu bar at the left... I think it's much cleaner now and might be easier to follow. A special 68th Anniversary message was added to the Home Page. SEMPER FI MARINES!!! The Home Page is getting back to normal. I've discovered how important backing-up your website can be. The Home Page was lost on 2/13 while I was making some changes on the website. I will hopefully have everything back in the next few days. The good news is that I have a lot of new material coming. So watch for updates!!! Started adding photos of 5th Marine Division units in Vietnam to the 5th Division Photo Gallery page. Started restructuring the 5th in Vietnam page. More to come. Added The Spearhead: The 5th Marine Division in World War II by Howard M. Connor to the 5th in Books & Film page. I know there are a lot of 5th Marine Division families out there that have their dad's or grandpa's copy of this fine book. Added Medal of Honor recipient William Harrell and started using Medal of Honor markers for all recipients on the Legends of the 5th page. Added Cpl. Gilbert F. Mayes to the 5th Division Tributes page. Cleaned up the Iwo Jima Videos page. Added Medal of Honor recipients Charles Berry, William Caddy and Robert Dunlap to the Legends of the 5th page. Added Chandler Johnson, Harold Schrier and "Boots" Thomas to the Legends of the 5th page. Added Surgeon on Iwo and The First Battalion of the 28th Marines on Iwo Jima to the Books & Film page. Added Moore Militaria and Hiki Shop to the Links page. Added a Happy New Year photo to the home page and a "What's New" page so visitors can easily find the latest additions to the website. I got this idea from Moore Militaria where I always visit their What's New page first.